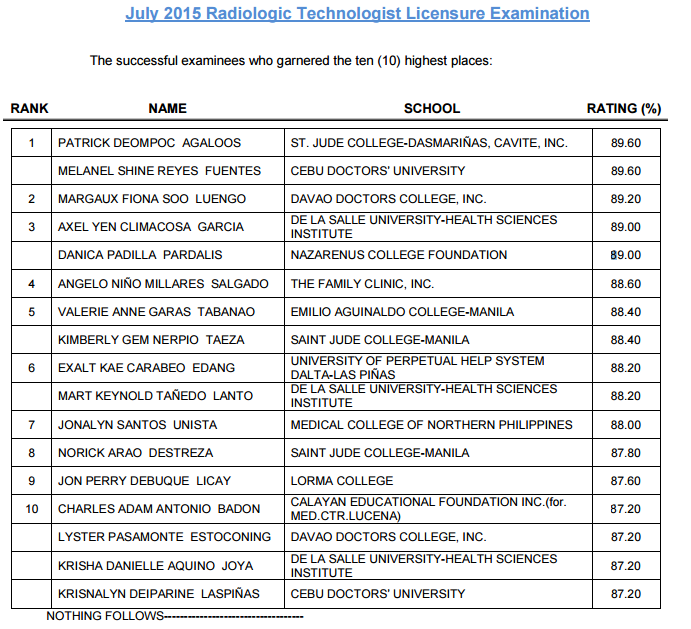 The Professional Regulation Commission (PRC) officially released today, July 9, 2015 the complete list of passers for July 2015 Radiologic Technologist (RadTech) and X-Ray Technologist board exam. Patrick Deompoc Agaloos of St. Jude College - Dasmariñas, Cavite and Cebu Doctors' University alumna Melanel Shine Reyes Fuentes tied on top spot for the (RadTech) board exam as they got identical 89.60 percent grade. Davao Doctors' College graduate Margaux Fiona Soo Luengo ranked second with 89.20 average grade. 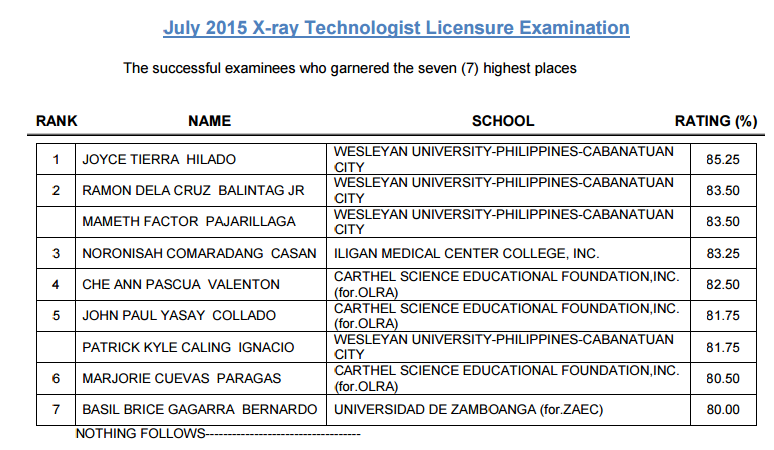 Meanwhile, Joyce Tierra Hilado of Wesleyan University - Philippines in Cabanatuan City topped the x-ray technologist licensure exams with 85.25 percent grade. PRC named a total of 1,325 out of 3,043 who have passed the Radtech Licensure Examination and 53 out of 210 who have successfully hurdled the X-Ray Tech Licensure Examination. ST. JUDE COLLEGE-DASMARIÑAS, CAVITE, INC.